The Independence of the Income Tax Appellate Tribunal is the need of the hour for effective administration of justice – The Tax Bar has a greater responsibility to strengthen the independence of the mother Tribunal and to promote an unpolluted justice delivery system. We are of the opinion that the Tax Bars across the Country may have to debate upon how bureaucracy has indirectly curtailed the independence of judicial fora like the Income Tax Appellate Tribunal and how to strengthen the judicial independence of the Income Tax Appellate Tribunal and to promote an unpolluted justice delivery system. The following incidences are an eye-opener for the citizens and taxpayers who are concerned with Independency of judicial and various quasi judicial forums. Ever since the Income Tax Appellate Tribunal was established in the year 1941 the head quarter of the ITAT is at Mumbai. In the year 1994 there was a move to shift the Head Quarter of the Income Tax Appellate Tribunal from Mumbai to Delhi for reasons best known to the Government. 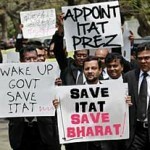 The ITAT Bar Association, Mumbai, took strong objections and sent detailed representations. On the basis of the representation made, Honourable Shri Atal Behari Vajpayee then as the Leader of Opposition (Lok Sabha) opposed the transfer of head quarters of ITAT from Mumbai to Delhi and wrote a letter to the then Minster of State for Law , Justice & Company Affairs, Govt of India and accordingly the move to shift head quarter to Delhi was stalled. From 1941 to 1996, the Power to transfer the Members of the ITAT was with the President of the ITAT, however in the year 1996, the then Law Secretary issued a notification, stating that the Ministry of law would have the power to transfer Members. It was again the ITAT Bar Association Mumbai, which filed a PIL before the Bombay High Court and the notification was stayed. When the matter was pending before the Supreme Court, the then law Secretary tried to interfere in the judicial functioning of the Tribunal and the Honourable Supreme Court in ITAT v. V. K. Agarwal (1999) 235 ITR 175 (SC), held that the then law Secretary was held liable for contempt, for interfering with the judicial functions of the Tribunal. The Supreme Court also framed guidelines for transfer of Members of the Tribunal (Ajay Gandhi v. B. Singh (2004) 265 ITR 451 (SC). 3. Residential Accommodation to Members of the Income Tax Appellate Tribunal. There were difficulties in getting residential accommodation to Members who had joined from the profession. The AIFTP filed a PIL and the residential accommodation was provided to Members of the Tribunal. (WP NO 2464 0f 1996 Income tax review April. 1997) also refer (1998) 97 Taxman 48 (Raj) (HC). 4. Office accommodation to Income Tax Appellate Tribunal for additional five Benches. When the Govt. sanctioned additional five Benches to Mumbai, the Govt. desired that the five additional Benches which was sanctioned to Mumbai be made to function from Navi Mumbai. It is the ITAT Bar Association Mumbai which filed a PIL before Bombay High Court praying that all 12 Benches are desired to function from one place only. It is due to the Court order, that all the Benches of the Tribunal are functioning from same premises. [WP NO 624 of 1999 (2001) 116 Taxman 418 (Bom) (HC)]. In the year 2003, the Govt introduced the National Tax Tribunal Ordinance dt. 16-10-203 (2003) 264 ITR 17 (St) to take away the powers of the High Courts to decide the substantial question of law. In the proposed National Tax Tribunal, Members of the CBDT were also to be allowed to be appointed as Members of the National Tax Tribunal. The Tax Bar across the country including the AIFTP and ITAT Bar Association, challenged the said ordinance and a stay was granted subsequently. The Ordinance lapsed. In the year 2004, the Govt. once again introduced the National Tax Tribunal Bill, 2004 (2004) 271 ITR 50 (St) which was referred to the Parliamentary Committee on Personnel, Public Grievances, Law & Justice. The AIFTP also made a representation before the Committee. The Committee was fully convinced that the National Tax Tribunal is not the solution to reduce the tax litigation before various High Courts. In spite of the reports of the select committee, the Govt. passed the Bill. The said Act was once again challenged before various High Courts. The AIFTP was one of the petitioners which had filed the petition before the Bombay High Court and a stay was granted. Ultimately Apex Court also struck down many provisions of the National tax Tribunal. [Madras Bar Association v. UOI (2014) 368 ITR 42 (SC)]. In the Year 2013, the Govt. amended S. 253 of the Act wherein the Retired Judge of High Court who has completed not less than seven years of service as a Judge in a High Court could also be considered to be appointed as President of the ITAT. ITAT Bar Association Mumbai and the AIFTP has strongly opposed to such proposal. “Pursuant to the newly acquired power vested in it in 2013 the Central Government appointed a retired judge of a High Court to be President of the Tribunal with effect from 14th March 2015. In my view, the conferment on the Central Government of the option to appoint a retired judge as the President is misconceived. The President has to perform various administrative tasks relating to the function of the Tribunal such as constitution of Benches, the posting of Members etc. which requires him to be a person who has worked as a Member for long period of time before he assumes office charge as President. The President is also a part of the committee to select persons as Members of the Tribunal. An existing Vice-President and more so senior Vice-President, would be fully experienced to discharge these functions. Though the selection process of the Members of the ITAT is undoubtedly one of the best methods followed there could be further improvements in the process of the appointments. Instead of improving the process, the Govt proposed to make an amendment in the Finance Act 2017 by introducing S. 184 of the Finance Act, 2017, where appointment of the Members is on tenure basis. This amendment had been challenged and is pending before the Apex Court. If the appointment of the Members of the Income Tax Appellate Tribunal is made on a tenure basis, it will destroy the institution and Members will be at the mercy of the Govt. for the renewal of their tenure, which will affect the independency of the Institution. In the interest of the institution, the Govt. should continue the appointment of the Members of the ITAT on permanent basis and not on tenure basis. When then President of the ITAT retired on 3-06 -2010, the then Sr. Vice-President continued as the officiating President till 14-10-2011 (on till his elevation as a High Court Judge). On 14-10-2011, Govt. appointed another senior most Vice- President as officiating President untill 1-9-2012. On 1-9-2012, one of the Vice-Presidents was appointed as officiating President till 12-03-2015. On 12-03-2015 Govt. appointed a Retd. High Court Judge as the President who retired on 17-02-2017. On 17-02-2017, the Govt. appointed one of the Vice–Presidents as an officiating President, whose term is renewed from time to time. Not appointing a regular President for the ITAT has affected the independence of the institution. Many decisions which can be taken by the regular President may not be taken by the officiating President considering past experience. Therefore the need of the hour is the appointment of a President of the ITAT on a regular basis in the interest of the institution. The sanctioned bench strength of the ITAT is 63 Benches (126 Members) which are functioning from 29 places. For the sake of administrative convenience, the Income Tax Appellate Tribunal is divided into 10 zones. Each zone is headed by a Vice-President. Accordingly the ITAT should have 10 Vice-Presidents and one President. The Vice-Presidents are required for better administration of justice before the Tribunal. At present the Tribunal has one officiating President and two Vice–Presidents. One of the Vice–President will be retiring on 9-7 -2018. After 9 -7 -2018 the entire institution will have to function under the admiration of one officiating President and one Vice- President. How can the institution function having only one officiating President and one Vice-President?. Non appointment of the Vice-Presidents on time demoralise the Members who are due for promotions as Vice-Presidents. The sanctioned strength of the ITAT is 63 benches (126 Members) whereas today there are 95 Members active of which 5 will presently retire hence at the end of 2018 there will be vacancy for 36 Members. The process of filling of the vacancies takes at least one year after the interview. The Govt. has not made any announcement for filling of the vacancy which means that for another two years there may not be any new appointments which is affecting the functioning of the Tribunal. There is also inadequacy in the number of staff and Assistant Registrars appointed, which has affected the functioning of the Tribunal. Total pendency of appeal before the ITAT on 11-2018 is 91,657 appeals (2018) AIFTPJ January. P. 73. It is desired that the assessee is able to get the justice within six months of the filing of an appeal from the final fact finding authority. By not appointing a regular President, Vice–Presidents, Members and not providing the desired infrastructure the motto of the Tribunal is “Impartial easy and speedy justice” cannot be achieved. In Mumbai, more than 10,000 appeals are pending before the High Court for final disposal. The delay in disposal of the cases before High Courts is mainly because of the delay in appointment of Judges and not providing required infrastructure. We hope the Govt. will give work on a war footing to fill the vacancies in the Judicial and quasi forums. The need of the hour is it is that the Bar which should play a proactive role by sending objective suggestions to the Govt. if the representations are not considered, we may have to ring the bell of the Courts. ‹ Appointment Of Tribunal Members Rules 2017 – A Veiled Coup By The Executive Over The Judiciary? A Long Legal Battle Ahead! Court order, that all the Benches of the Tribunal are functioning from same premises. [WP NO 624 of 1999 (2001) 116 Taxman 418 (Bom) (HC)]. However , as both ITAT and I Tax dept. are governed by different ministries, i.e Ministry of Law and the Ministry of Finance respectively, for the sake of more independence and the free working environment, in day to day functioning of the staff of the I Tax Appellate Tribunal staff , the office of DR of I Tax Dept and its staff , needs to be shifted in another premises,as such, both should not be situated within the same premises. Well researched article.Now the SC has advised competition exams for new members on all india basis and a cadre based flow for vacancies for all type of tribunals,a paradigm shift is there and we should look forward to the tumultuous changes coming.Hope all issues raised shall be taken up after fundamental changes recommended are accepted. Attempt to post comments has been instantly failing /aborted ! requires to taken a conscious note of, in order to remain alert / cautioned against ! Among the listed , ’11. Impartial easy and speedy justice’ stands out as the matter of most important concern; that is, to one and all , – besides the professionals comprising the BAR, – the clientele/litigants, being the ultimate supposed-to-be beneficiaries. As for both the BAR and the BENCH, what calls for an effective and topmost priority is a cohesive realization of the fact that, the BENCH has a greater role to play in avoiding /obviating the woeful “inconsistent decisions” being taken at the ITAT level itself, instead of before the courts, in order to accomplish the desired objective,- of impartial,and speedy justice. On the flip side, with the same breath, inviting attention to the obnoxious scenario / mind teasing changes taking place/challenges being faced with elsewhere – for instance, looking through the threatening development by way of governmental proactive interference with judiciary / its functions reported from the US- that should be taken as sufficient caution, for both the Bench and the Bar to remain alerted !